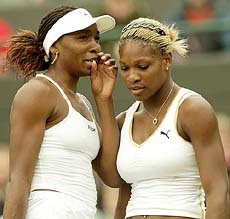 Tonight, ABC Family serves up its new reality series Venus and Serena: For Real, where the tennis-playing sisters put their lives on display for all to judge. We're going to avoid obvious tennis puns about reality TV being a "racket" and that you're sure to "love" this show that could become the "ace" of ABC Family's lineup. No, really, we're not gonna go there. A Chicago family featured last year on Fox's Renovate My Family filed a lawsuit Wednesday against the network, claiming shoddy work created safety hazards in their home. When the show was finished "fixing up" their house, the family claims, they found wobbly railings, incomplete electrical work and badly designed rooms. I say: you get what you pay for, reality fools. The Conner family has reunited- in a bowling alley, of all places. Roseanne, Dan and the whole clan got together this week for first time since Roseanne ended its prime-time run in 1997. They're publicizing the upcoming release next month of the sitcom's DVD debut. The series was widely regarded as a milestone, redefining the way working-class families were portrayed on TV. Roseanne was joined by co-stars John Goodman and Laurie Metcalf, as well as the three original actors to play the Conner kids: Alicia Goranson, Sarah Gilbert and Michael Fishman. What, no Sarah Chalke? Those bastards. 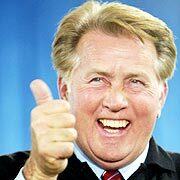 Martin Sheen may guest star on son Charlie's Two and a Half Men next season. The elder Sheen is expected to exit office as President Josiah Bartlet on NBC's The West Wing this season, leaving him plenty of free time to slum on what's now TV's highest rated remaining sitcom. And with the pressure of replacing Everybody Loves Raymond, who could blame Men EP Chuck Lorre for a little stunt casting? He should get Emilio on the phone while he's at it. In a hilarious juxtaposition of names in the news, grey-haired CBS news viewers watched newsman John Roberts anchor the network's special report on President Bush's nomination of federal court Judge John Roberts. Wish I could have witnessed the hilarity as millions of confused, codgerly viewers cranked up their hearing aids to eleven! Roberts, who's the CBS News White House correspondent, joked in an e-mail to colleagues that he will need be addressed from now on as "your honor." He also promised to wait until sweeps before overturning Roe v. Wade. Of course, there's no real relation betwixt the two Roberts. ABC's inexplicably popular summer smash Dancing With the Stars will boogie on in 2006. ABC hasn't decided which quasi-celebrities will front next years competition, or when it will air. But it will be interesting to see if it can replicate its numbers outside of the summer ratings wasteland.